On Monday, we went over how easy it is to become a millionaire. Today, we’re going to look at a few people that have done it and have done it quickly! We’ll start with Mr. 1500 Days (he’s one of my favorites!). Now he started 2013 with over $585,000. He managed to hit $1,000,000 for the first time less than two years later! Note that Mr. 1500 days uses Personal Capital as well! If you look at his monthly numbers, he was knocked under $1,000,000 three times since first hitting it! 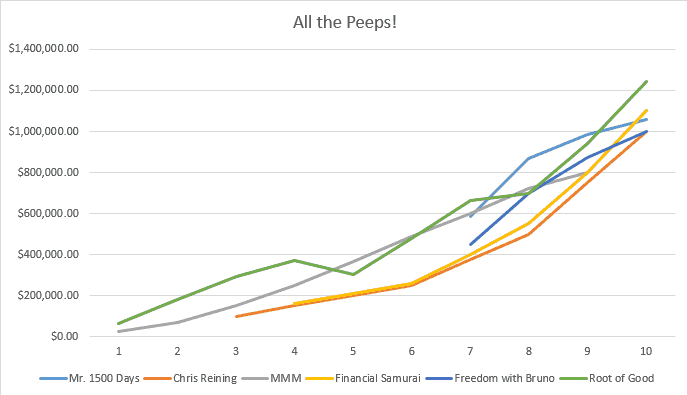 Financial Samurai’s journey started with a lucky stock market deal, but continued with consistent 401k max-outs, smart job moves, and buying real estate (and having a rental in SF!). He captions it: “Slow and steady wins the race. Go team tortoise!” But really, he’s among the elite that have managed to hit a million dollars in a ten-year span! Chris has declared that becoming a millionaire is a letdown. It turns out, when you save and invest money, one day, it just happens! He’s also so nicely set out his path in an awesome chart! Since he is one of the BIG names in early retirement, Mr. Money Mustache is showing the world how it’s done! Steve over at Think, Save, Retire has also argued that you don’t need to be a millionaire to retire. 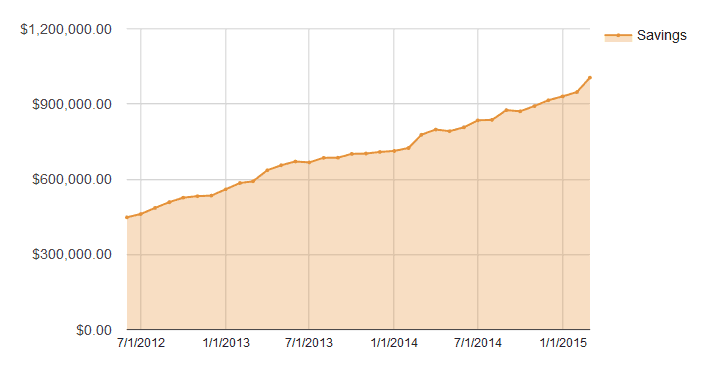 If you’re like me, you like to see aggregated data… maybe even graphs! Well, friends, you’re in luck! I’ve mapped out the above numbers (the ones I was able to pull out specific numbers) on one graph so you can compare! I like looking at this all together. There’s definitely an exponential growth kick right at the end of the journey for half of our millionaires. Also, once you hit $500,000, it’s completely possible to hit $1,000,000 in 4 years! What’s the secret formula? High savings rates. The market has helped these guys, but the major strides they make each year are mainly their own contributions! Who’s line will you follow most closely on your path to early retirement? Track your line by signing up for a FREE account with Personal Capital. Personal Capital links on the blog are affiliate links. At NO COST to you, we get a “thank you” commission if you sign up through our links. If you don’t feel good about that, open a new window and go directly to their landing page. Saving a Million Dollars is Easy! Cool post! Nice to see these numbers from different bloggers all put together into a single page. You’re absolutely right, a high savings rate is the primary factor in achieving millionaire status. High incomes can make it happen faster, but they aren’t required. I love all of this, but I especially love your point that consistent, high savings makes it possible! Nice graphs! A high savings rate really helps, because like in our case we really didn’t start this journey or focused savings until about 5 years ago, maybe 4? We’d been consistently saving, but not at high rates, as we were not in that mindset back then. With the last 4 years of focus towards saving more, we broke into the double comma club, and then went under and then over, then under, like Mr. 1500. We started off pretty negative asset wise. 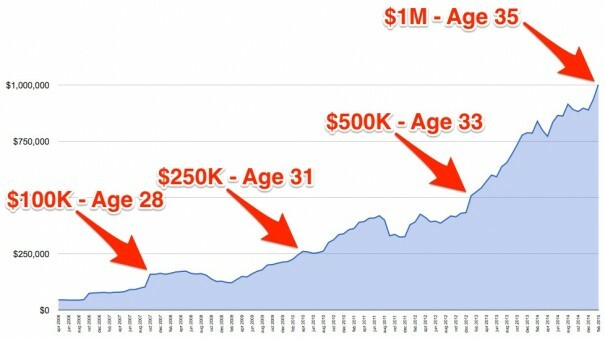 In 2008, I had $64k or so of student loans and ~$18k of credit card debt, plus, like a financial genius I’d cashed out my 401k so no assets for me. Mrs. SSC had about ~$40k in a 401k and ~$40k in savings from a previous home sale and no debt. We focused on paying my debt down quickly, and saving minimally until debt was paid off, and then turned the “debt money” towards savings/investments and ramping that up even more. That approach should lead to us hitting our number in about 2 more years, which is only 10 years after starting in this industry. Not too shabby when you think about it like that. The higher salaries helped socking away more, but the concept is the same regardless of income level. Pay down high interest debt, and then turn that money towards even more savings, all while living below your means. We have found once we hit a certain point our input into the savings isn’t the biggest driver anymore. 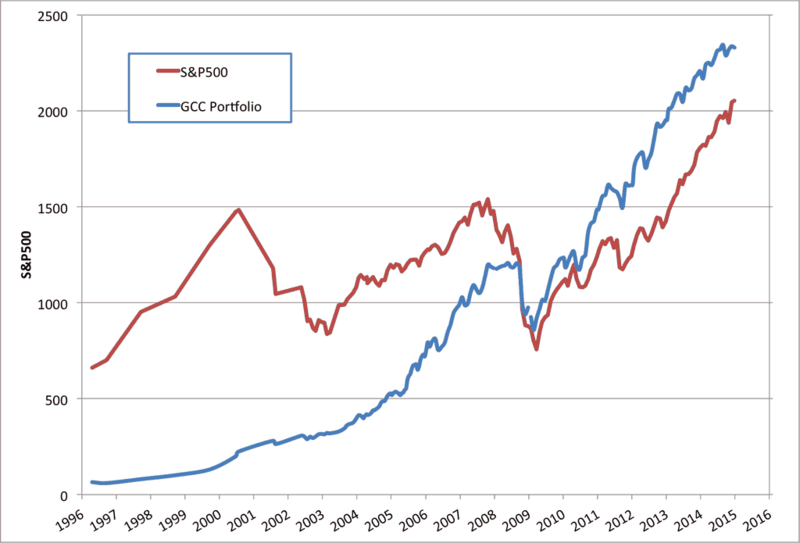 The market has a way stronger influence over our money now than we do by contributing to it. That’s a nice and scary feeling at the same time. For instance, if we stopped contributing to our egg right now, we’d still hit our number by 2020 with a 4% market return. That’s nice. Conversely, If the economy tanks, markets tank, and more, our investments could drop like mad and we’d be SOL until the market recovered – I’d still be buying stocks on discount, but we’d be forced to working longer waiting for the recovery. That’s scary. Whatever – I can’t complain about having to wait until markets recover and possibly working until I’m 45 – gasp! the horror! 🙂 It’s all relative, so keeping perspective in these matters helps. Like Steve points out, you don’t need to hit the double comma club to be FI, it’s more about what your lifestyle needs cost and what your risk tolerance and FI plans are. We spent our first year to FI really paying off some debt. Now, we are really mimicking the same path as MMM. Ought to hit that magic FI number in 4.5 years! Nice! We’re not really on the chart yet, but if we choose to save a cool million, it’s still possible in a ten year span! Great collection of figures from some awesome bloggers. Becoming a millionaire is not one of our goals, so the years are more of a focus for me, and really encouraging. These families achieved enormous change in their financial status within a relatively short amount of time. It gives me hope that we will be able to pay off debt and build up enough assets to reach our goal of financial semi-independence, by 2022. Yes, Harmony! Me as well. We still haven’t figured out our entire plan. I think we’re going to be flexible. But either way, seeing these possibilities helps tremendously. Once the ball starts moving in the right direction, momentum is behind you! I love seeing the numbers from everyone in the PF community! Seems like if you have a high income, just try to live like a normal person for about 10 years or so and you’ll easily hit a million! Truth. But it’s possible even without a high income (harder, but still possible). Very cool compilation! Makes me want to put a graph as well. I really think 3 million is the new 1 million now due to inflation. I also think we can all get there if we continue to just save and invest over the long-term! Thanks for putting this post together. Great article! And I love the graph at the end, it satisfies my analytics side. 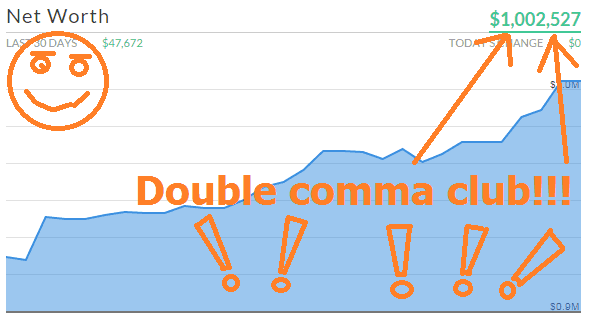 I should hit the double comma club in a little over a year, unless the markets decide otherwise, and I can definitely confirm that things grow exponentially after 500k, once investment gains become meaningful. The first 100k is the hardest, as is the first 1M. In other words, it’s exponentially easier! Great minds think alike! Now that we’ve hit the first 100k, we’re clawing our way to 500k and then counting on the exponential upswing from there! Very cool look at the various ER bloggers in the community and where/how they hit the million mark. You ARE the richest one! Your graph proves it! I expect not only a couple beers but a steak dinner to boot. Ignoring the little people is what happens when your site gets huge and you get to swim in a bathtub of money every day if you want. And drinking all the beer and eating all the steak. Looks like I’m all out. Who’s buying now? I’ll happily fly to Alaska to go fishing and inhale nature every day during the summer! Been there once and flew a puddle jumper to a like in the mountains in the middle of nowhere. Awesome time, awesome place! It’s cool to see all aggregated like that. Hopefully I’ll be able to tell my double comma story someday (soon)! I just read Sam’s comment and nearly had a heart-attack. Is that like 50 is the new 30? (I can tell you it is NOT). Still if I was living in SF, I would want $3M. Real estate would eat one third to a half of that quite quickly as Sam has discussed on his blog many times. yup and yup. 3 million is definitely not a goal of ours, but makes sense for some. I’m just running exercises on de-stigmatizing millionaire status. It’s easier than we think to hit. Inflation is a KILLER! Don’t we all remember 90 cent gas and public school costing $3,000 a year or less just 20 years ago? I linked to the post with a chart of all the pre and current prices. Scary! Especially $60,000 a year private school costs. Yikes. Why don’t we have 10 cent movies (with popcorn) anymore?! Agreed that inflation is a beast. Or $1 Whoppers with Cheese or 25 cent bowling rounds! Ah, the good ‘ol days! But alas, things like the real estate market is finally starting to cool. Now it’s time for us to hustle to catch up with some extra income rocket boosters! Thanks for this informative list of millionaires and how they became. I found Zero to a Millionaire story most interesting. Yup. Many of done it and it’s possible for anyone! Cool summary. We were the tortoises for sure from about 2000-2013. Saving into 401ks, 529 plans, REITs, IRA’s, building cash. Oh and did I say living life to the fullest? We also bought our mountain home in 2013 and have no mortgage on that so that is saving well, I guess. The last couple of years we have been picking up the pace significantly in terms of more aggressive saving as we see the FIRE date within grasp. Although it feels like the last mile of a very long hike…..we’ll get there but it feels oh so slow even with that line in sight…. We just started our own journey to reach financial independence as early as possible. We do not have the entire plan laid out yet. We are already making some lifestyle changes in order to see how these changes can improve our situation. Seeing how quickly others got there is a big encouragement. Ah, the days of the pensions. So few are blessed with those anymore! Congrats! Great idea to combine several of these together — love the chart. It IS possible! Patience. Persistence. Courage! Yes! Yes! Yes! Onward and upward! This is such a cool post! Thanks for doing the legwork to put it together. It gives me hope! Thanks for putting this post together! Really great idea. To answer your question, I’ll probably reach it the frugal/entrepreneurship/dividend investing way. I’m fine with making sacrifices. We still haven’t figured out what our path will look like… but this all makes it seem totally doable. You’re making me want to share our numbers so bad! But yes, I can totally attest to the upward slope that happens after a few years of saving hard, once you get the tailwind of compound interest on top of a high savings rate. Love that you compiled all of this stuff — so cool to see the aggregated chart especially! NUMBERS! (just kidding, no pressure). I’m counting on that exponential curve post-$500,000. This beginning part feels like we’re clawing our way there! This is a great round up of the most inspirational financial bloggers and how they reached their first million. Thanks for putting this insightful post together Maggie. With all your interest in hitting the first million lately, have you been thinking about putting a fast-track plan together? This is a great post. Excellent job pulling in the necessary data. Awesome post Maggie! Thanks for putting this together – it is very encouraging! Thanks Matt… I needed the encouragement! Maggie, not sure how, but I just “found” this one. AWESOME 10 year chart comparing all of the millionaires. Really interesting, and encouraging. I’ve not published my numbers, but I too have surpassed $1M. I’ll have to compare my “curve” to the others, I suspect it’s similar! I would love to hear your results (for personal reasons!) to see if your line is pretty similar. I am hoping if we can claw our way to $500k, we’ll hit a million 2-3 years after that! I don’t know how I missed this one! Love the graph where you overlayed everyone’s numbers. I feel like I probably don’t need a million bucks for just me, but I certainly wouldn’t turn it down. Assuming that I have gainful employment for most of the remaining years in my 30’s, I wonder if I can hit that number before 40. That would be 9 years, and most of these folks did it in 10 or less, sooooo…..time will tell. Thanks TJ… my thoughts are very similar to yours… we shall see how my trajectory goes! Awesome post, I love all the data! Great to see everyone side-by-side! Thanks Jon! It was fun to put together! Late to the party, Maggie, but thanks for including us in your illustrious group of retirees! I’m a big number/graph/spreadsheet nerd and you created a cool summary 🙂 Working on 2016 annual spend numbers at this very moment! Best to you up in Alaska! Fascinating summary. Investment gains have been stellar over this 7 year bull market. I’m preparing myself for more brute force saving and less investment gains in the upcoming decade. I agree! Though I think markets tanking now will be good in the long run for us all to reach independence!